This photo, which was taken near Fruitvale and posted on a FB group then later removed, had some locals fearing for the well-being of the officer involved. “The two officers (in two separate vehicles) were turning off the Waneta highway onto Seven Mile Dam Road. The first officer slowed to turn, and the second officer realized he wouldn’t be able to slow in time to avoid hitting the first officer, so he went off road right. The police vehicle, a Chevy Tahoe, was destroyed, but the officer was checked out in hospital and cleared to return to duty. As for the cause of the crash, Wicentowich pointed out the officer was driving Code 3 at the time. 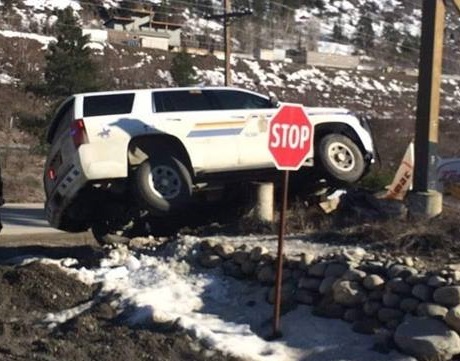 The officers were responding to a fatal MVI (see https://castlegarsource.com/news/two-youth-presumed-dead-pend-oreille-crash for details).